This T&C template governs the use of websites that provide membership-based services, such as introduction sites, dating sites, fan clubs, enthusiast sites and support networks. Inclusion of terms that comply with Electronic Communications and Transactions Act 2002 make it suitable for consumer- and business-related sites. It includes strong protection against misuse use of your site and posting of offensive or inappropriate content - terms likely to be important when members can interact with other on the site. This template provides T&C for a website that offers a membership based service. You could charge a subscription or provide some or all of the services for free. The template includes terms that help you to comply with the Consumer Protection Act 2008 making it suitable whether your members are private individuals or businesses. Typically, member-based sites allow users a high level of interaction with the site, and with other members. This template includes extensive terms relating to acceptable use and removal of offensive content. These aim both to dissuade your members from mis- or malicious use of your site, and to give you additional protection from claims relating to the actions of, or content posted by, your members. This template has been written to cover international use because sites that would use such a template are likely to attract visitors from across the world. It has been written to comply with South African law, but much is likely to be enforceable in many other legal jurisdictions as well. protect your business from complaints about content that your subscribers posted – particularly important if your members can contribute content to your site that you might not moderate in real time. We have another very similar template if you operate a site used only by businesses. 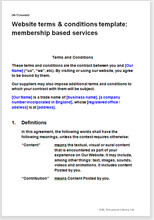 See Website terms and conditions template: member services for businesses. If your site creates a marketplace for goods or services (where buyers are connected with sellers and transactions occur through your site), one of our terms and conditions templates for marketplace websites might be more appropriate. See Website terms & conditions for marketplace sites. If you are in any doubt as to which T&C template you should choose, please contact us. The law in this T&C template is largely common law that deals with the basics of contracts: offer, acceptance, price and payment, delivery, liabilities and risk. That means that, by and large, you can set the commercial terms you want. Our guidance notes will tell you what you can change safely. This document also contains paragraphs that provide intellectual property protection, both governing how your site content is used by your visitors and subscribers and how information posted to your site by your visitors can be used by you. For clarity, we set out the rights that your customers have under the Electronic Communications and Transactions Act 2002. Miscellaneous legal matters to protect your business.